Project Perfect Mod :: View topic - Open Source HVA Builder 2.14 has been released! Posted: Wed Nov 08, 2017 5:32 am Post subject: Open Source HVA Builder 2.14 has been released! Howdy! We have more news today and this is a good one! Two new updated programs at once. The big deal is with the newest version of Open Source HVA Builder 2.14, although Open Source Voxel Viewer 1.83 also goes as a bonus. - Updated: Voxel Engine updated to 1.40. - Added: You can now cap the rendering speed of the program up to 60 fps. It prevents it from unnecessarily burn your gpu and battery. FPS cap is enabled by default, but you can disable it in the Preferences -> Rendering Options. - Added: You can change the palette in the Preferences -> Palette Options, using palettes from the TS and RA2 directories. The game is also determined by you, by choosing it near the Preferences in the menu. - Bug Fix: View Transform now works correctly. - Bug Fix: If you've downloaded the 2.13, the rendered voxel always update when you change something on the interface or on the voxel itself. - Bug Fix: Additional memory leaks were fixed with screenshots, voxel sections and voxel views. - Bug Fix: 360 degree animation no longer has blank frames. - Bug Fix: A minor issue with 360 degree animation rotation has been fixed. The rotation starts after the first frame. - Note: Despite versions 2.13 and 2.14 were coded from 2.1 the code (instead of 2.12), all features from 2.11 and 2.12 are valid for 2.14. This version does not have the features from 2.2 WIP 1 from stucuk, since its source code has never gone public. 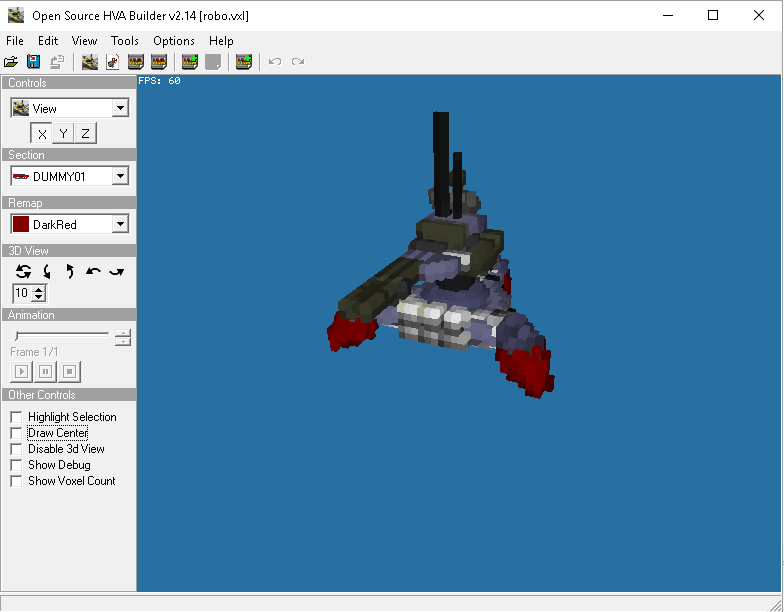 This version also marks the first OS: HVA Builder that is in our SVN, together with OS: Voxel Viewer and Voxel Section Editor III at the same repository. Since OS: HVA Builder shares the same Voxel Engine with OS: Voxel Viewer, we also have a quick update on the OS: Voxel Viewer itself. But, truth to be told, I don't think anyone will see any difference in this version. Except for the updated help file. - Fixed: Rotation does not move in the first frame of a 360 degree animation. - Improved: Updated with Voxel Engine 1.40. It eliminates a couple of memory leaks. And now, you no longer need to apply quick patches for the OS: HVA Builder. You can grab 2.14 in a single package. OS Voxel Viewer 1.83 can be downloaded here. If you run a website, feel free to also mirror these tools there. Enjoy it! Excellent, i really focus on rotation, i actually had bugs throgh the years with it. FINALLY!!! NO MORE BLANK FRAMES!!! EDIT: I tested it, it still has blank frames, I was decieved! Should I uninstall the 2.12 before installing this update? Hey Banshee, we can merge all sections of voxel into one section in HVA Builder ??? No, you need to copy & paste the sections together in VXLSE. After fiddling around with HVA builder today I got quite annoyed at the FPS lock. So I was confused because I was certain that the update I downloaded a while ago said the FPS etc was fixed. Thing is.. The installer installs version 2.1, not 2.14. I uninstalled HVABuilder multiple times using the uninstaller, just in case. Whenever I install "2.14" (even the installer says so), all that's being installed is 2.1. EDIT: So I downloaded 2.18d using the webSVN site.